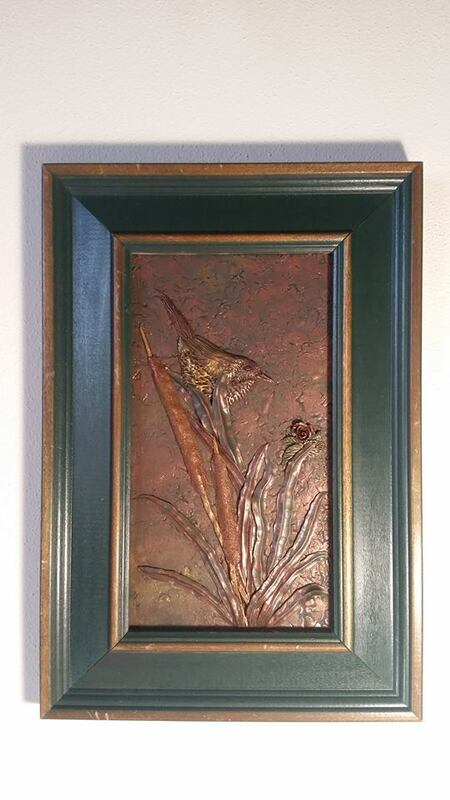 Over the last few months, I’ve been using thrift store frames as inspiration for sculptural paintings. Some of the metal ones seem to be heat-tolerant enough that I can do a final bake onto the metal of the frame itself. I’ve had to get creative about supporting clay while it’s baking, but it’s nothing that small sheets of glass, scrunched foil, and crockware can’t fix. The biggest challenge has been to try to match the frames in a way that looks good and intentional. This dark copper is by far the most popular color scheme, and I’m certainly partial to it. I didn’t stretch the color scheme far enough here, and I think that the piece suffers because of it. We’ve been scouring thrift stores for more of the dark copper styles, but I’m also trying to stretch myself a little more. While I think that the pieces that spill out over the frame are charming, I’m also using some frames in a more traditional way, hoping that the artwork will stand on its own. The approach that I take is mostly determined by the frame’s durability. So far, this new direction has led to my first gallery sale and then to my first piece that was accepted to a juried show. I have to tip my hat to Chet for suggesting that I make things to hang on a wall!